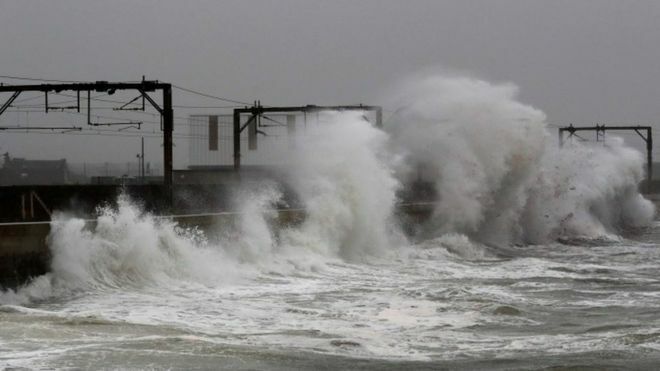 Two widespread flood events affected Scotland in October. 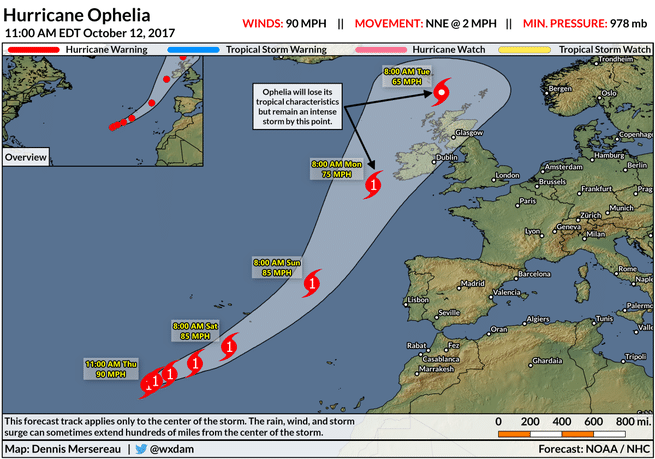 One affected a very large area of the West Highlands, and the other, related to Storm Callum, widely impacted England and Wales, but just clipped the south of Scotland. 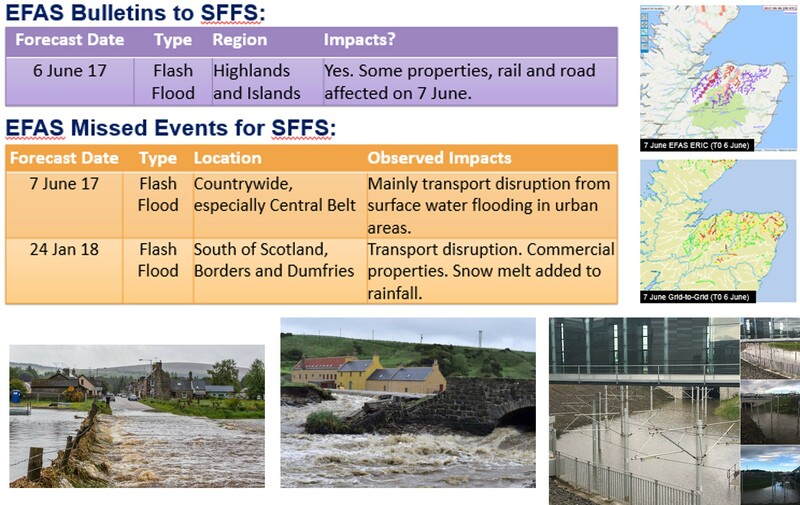 In both cases the flood risk matrix on the Flood Guidance Statement was put to good use to indicate the potential severity even when there was still uncertainty on where the impacts would be. There was widespread heavy rain over two days, predominantly in the West Highlands as far south as Ayrshire. The risk was highlighted at the end of the previous week, with FGS yellow (minor impacts likely) from Friday. Upgraded to significant impacts likely (amber) on Monday for area W of Glasgow due to rain fallen plus forecast. In the event this was downgraded the next day, but there was a widespread event with rainfall in excess of 200mm in some places. Mainly road flooding, landslides etc. The flow return period was probably <5yr in most places, though maybe locally more severe. 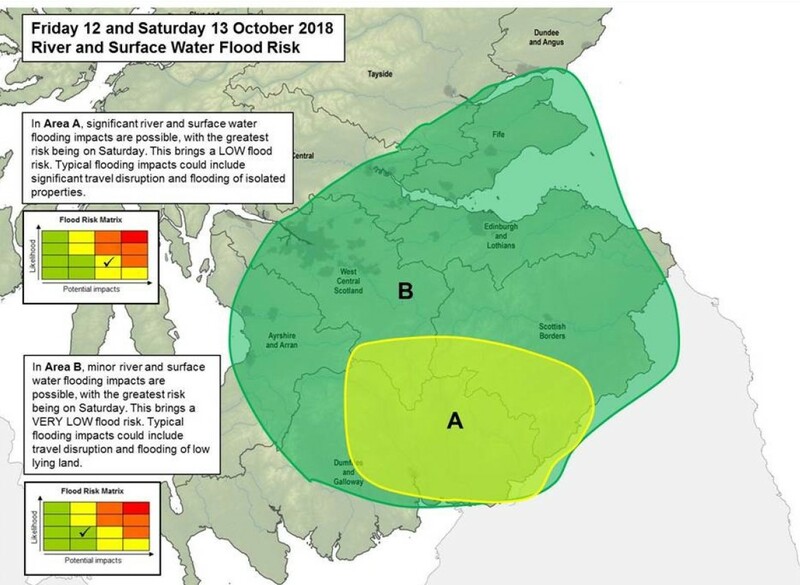 This was well forecast with plenty of lead time, though there were few areas at risk and warning schemes in the area most impacted by rainfall and rivers. Amber was based on information available at the time, downgraded when forecasts came down. 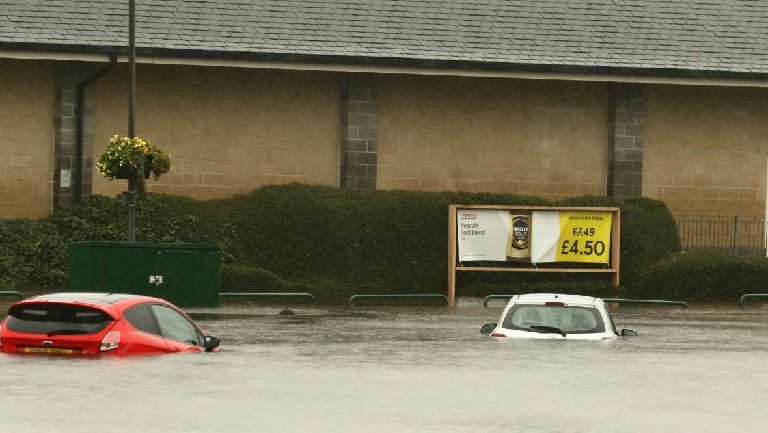 Widespread heavy rain was forecast to hit northern UK several days in advance. 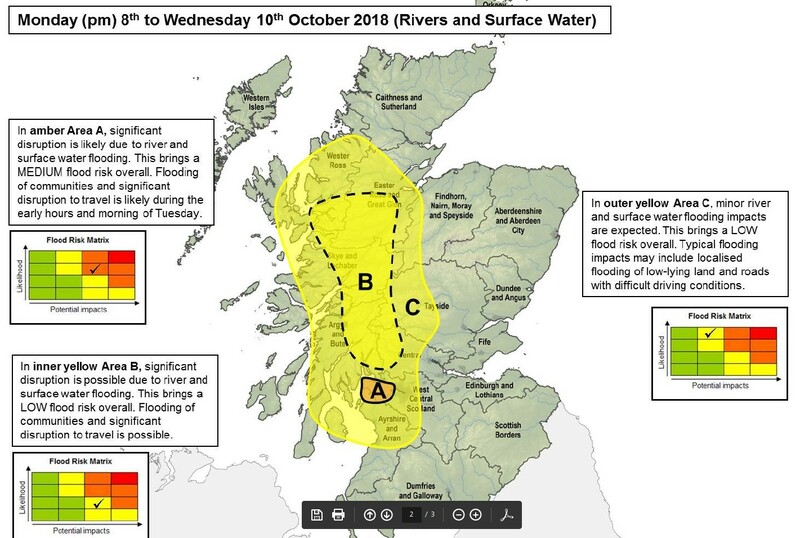 On Tuesday we highlighted significant impacts possible (yellow) for south of Scotland on Saturday. In the event the bulk of the rain was across the border in England and Wales. Some gauges in Scotland recorded around 60-70mm in 36 hours. There were high flows in the south of the country with minor impacts, and Hawick approaching flood warning level. This was well forecast in a UK context and we were correct to highlight possibility of significant impacts, which did occur elsewhere in the UK. In both events, the Met Office had clear sight for several days that heavy rain was coming, allowing us to give Day 5 notification of potential impacts. We were then able to adjust the likelihood, location and expected level of impacts by using different parts of the matrix as we got closer to the event. 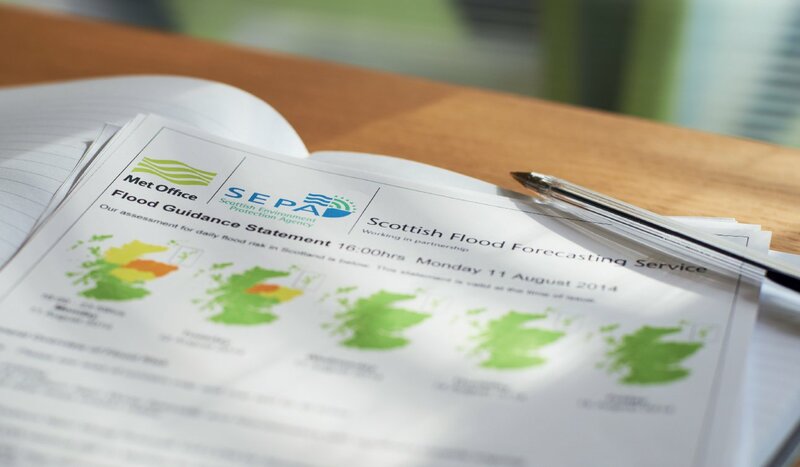 Since its inception in 2011 the Scottish Flood Forecasting Service has provided forecasts of flood risk out to five days, by way of the Flood Guidance Statement sent to the emergency response community. Since then the scope and accuracy of medium range forecasting has increased markedly, with the result being that a reasonable view can be taken of at least the possibility of extreme weather occurring beyond the five day forecast window. 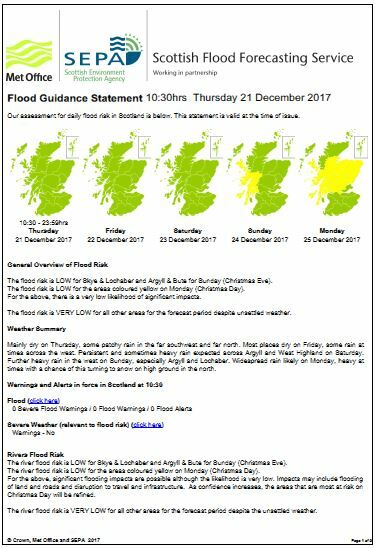 It’s not expected that this section of the Flood Guidance Statement will be used very often, but the ability to use it will allow us to provide useful information when available.